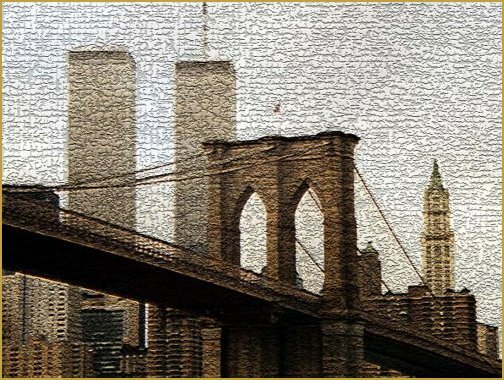 The Twin Towers Alliance » Take Action! We Can Still Build A World Trade Center Worthy of the Name! Every year that goes by it becomes harder to restore the magical skyline that was destroyed on 9/11, but we can still insist on Twin Towers at the World Trade Center. It is simply not the World Trade Center without them. Dozens of twins have been built around the world since 9/11 and modified twins can still tower above the Freedom Tower in place of WTC towers 2 and 3 and straddling the underground portion of the transit hub. We can’t tolerate the defeatists in our midst. It’s NOT too late to put the Twin Towers back where they belong. Otherwise we are rewarding those whose lies and abuse of power kept the Towers down. That would be wrong anywhere, but at Ground Zero it is a terrible disgrace. How could something that is so wrong for the country be inevitable? Only if we accept it. Don’t! We are fighting against those with the mega-bucks to force their plan on the rest of us, those who think it is their World Trade Center, and for that matter, their country. We don’t agree. In a match of ideas we can win hearts and minds. They have no answers. They can’t justify what they’ve done or are planning to do because it is based on a lie. Winston Churchill said, “A lie gets halfway around the world before the truth has a chance to get its pants on.” We need your help. Democracy can only work when people have all the facts so that they can make informed decisions. The single most important contribution you can make to this cause is to tell others what we’re doing because most do not know. They think it’s a lost cause and that they are in the minority. THAT’S NOT TRUE. We hear from people all the time who are amazed that they didn’t know about the organized resistance to the World Trade Center that is being forced on the people. That’s no accident. Don’t be a passivist! — Use a signature on your emails to raise awareness — along with a link to this site. — Tell 10 people about this effort and encourage them to visit this site. Tell officials that you want them to start listening and you want answers. They were hired to a job and when it comes to the World Trade Center they have all failed to perform. Thanks to makenynyagain.com for permission to use their contacts list. Design and coding of the petition by Covered Web Services. Graphic Design, Flash Animation, and The Twin Towers Alliance Logo by Fard Muhammad. Collage, YouTube Tribute, and Other Graphics on the site were made possible by the creativity and collaboration of Jenny Inman, Tracy Gall, John F. McNeece, Jr., James Gitlin, Lisa Schneck, and Alex Davison. Sidewalks of New York presentation on the Restoration Alternative page was made possible by those who shared their snapshots with us and especially by the hard work of Eric Schneck. Send suggestions and offers to help to rebuild@twintowersalliance.com. Help us to make this website as effective as it can be. OTHER SITE OR PETITION USING OUR NAME AND IDENTITY SHOULD BE ASSUMED UNLESS A LINK IS PROVIDED.